Are you looking to find a chore chart for your kids at home? Something to help them get into healthy routines with daily chores and engaging activities that teach kids about responsibility and accountability? In this review of the best chore charts for kids, you will find some of the top brands to choose from and all are rated by parents from all over the world for helping parents. So really, how many times have you been amazed at how spoiled and entitled some people’s kids seem? We’ve all witnessed the 4 year olds who throws a temper tantrum because Mommy or Daddy has asked them to clean up a mess they’ve made. We are also aware of the preteen who rolls their eyes and sighs audibly because their parents have asked them to do something they’d prefer not to do. If you are like many people, you told yourself long before you even had children that things would be different when you had kids. Your children would be part of a happy, functioning family and would be given age appropriate responsibilities. You hoped that no one would think that your children were entitled. They would behave themselves most of the time as well-brought up children usually do. Fortunately, there are some helpful tools to aid you in achieving these goals. One of these solutions helps children with completing some of their household responsibilities and enables them set goals to improve their behavior. Chore charts can help make children of all ages more responsible, willing to work harder, and can help keep the peace at home or in public. They make a game out of completing tasks children might otherwise find unpleasant. Plus, considering that many modern day families have two working parents, sharing the work required to run a household makes life less stressful for everyone in the family. Everyone is part of the team. Even children can take pride in how successful the household is run. Chore charts provide an organized, central, and fun way to ensure accountability. Of course, chores should reflect a child’s capabilities. Starting young means that your children will become used to the idea of helping out around the house and behaving themselves regardless of where they are. Even toddlers can help out a little bit by putting their toys away and placing their dirty clothing in the laundry hamper. Preschoolers can make their beds and bring in the mail. School age children can take on more responsibilities like sweeping, setting and clearing the table, doing the dishes, tidying their bedrooms, vacuuming, and feeding the family pets. Teenagers can do all these and more. They should be capable of cooking meals, babysitting siblings, mowing the lawn, and cleaning the bathroom. Giving children a strong sense of personal responsibility provides them with the knowledge that you trust them to be able to take care of themselves to some degree. Once they have mastered one of their tasks, they can take pride in their accomplishment. They will be far more willing to seek out new challenges. Children learn to set goals and can celebrate when they reach each one. Household tasks become the gateway to achieving goals beyond the children’s home life. They help cultivate a “can do” attitude that will help your children throughout their entire lives. Parents have a responsibility to help their children become functioning, responsible, socially well adapted adults. We have assessed several different chore charts in order to provide some guidance and understanding of what products are currently available and which ones might be best for your family. Of course, parents are free to design their own, but the following products are all reasonably priced and attractively constructed. Children love them and parents rave about them. The Roscoe Learning Responsibility Star Chart is an affordable, brightly colored and engaging chart which has been reviewed positively by parents. There is room for three children to use one chart, and among the fun and motivating things about this particular product are that it sets up a friendly competition among siblings. Using magnets on a dry erase board, children are able to use the chart without parental involvement and have the satisfaction of checking off each chore with stars. Parents are able to amend the chart quite easily if the child did not complete the chore adequately. There are spaces for ten chores to be listed for each child and children are able to identify individual goals and rewards. Parents and children can choose from twelve preprinted chores or they can write in ones of their own choosing. This product seems to work well with school-age children. Unfortunately, the chart’s small parts make it a potential choking hazard, and it is not recommended for children under the age of three years. It does, however, provide thicker magnets that are designed to stay on the board. This prevents the magnets from falling to the floor where younger children and pets might find them. 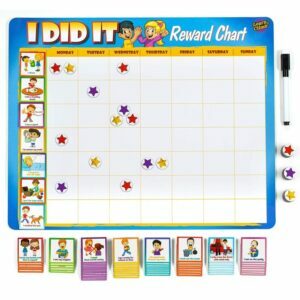 Kenson Kids “I Can Do It” Reward and Responsibility Chart is available at a similar price point as the Roscoe product and has similar outstanding parental reviews. This bright and colorful 8.5”x 11” chart provides a variety of categories applicable to preschool and younger elementary school-age children. These include: get dressed, brush your teeth, good manners, make bed, set table, and several more. 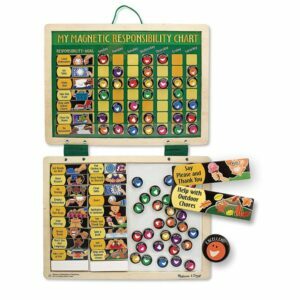 In addition to the twenty preprinted responsibility magnets, three options are left blank so that parents can determine tasks not already included with the set. There is space for six tasks and there is an area to identify an overall goal and reward. Forty-five stars are provided for marking off tasks each week. Each child will require their own chart. This chart will appeal to children who prefer a simpler, “less busy” visual representation of their tasks and goals. Because it has both a magnetic backing and hooks, it can be hung almost anywhere. Like the Roscoe star chart, this product is not recommended for children under three years of age. For slightly less than the Roscoe and Kenson Kids products, the Melissa & Doug Deluxe Wooden Magnetic Responsibility Chart provides a bright and pleasing background for recording completed tasks. It includes 90 magnets featuring a variety of chores and desirable behaviors such as clean room, set table, no teasing, and rewards such as excellent and well done. Also included are some blank magnets so parents are able to customize the chart for their child. Suitable for one child, there is space on the board for seven tasks, but no space for establishing a goal or reward. There is, however, a storage area right on the board for the spare magnets. Because this product does not have a magnetic backing, it does require some hardware (like a hook) to affix it to a wall or other surface. Like the others, it is not recommended for children under three. According to some of the less favorable comments made by purchasers, there is some concern about the wood warping and not laying flat with the additional problem of magnets sliding off the board. The company does have a guarantee, and wishes that anyone having any issue contact them so that they can rectify the problem. 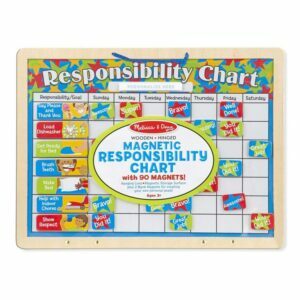 The Melissa and Doug Magnetic Responsibility Chart retails for a similar price to the the Roscoe and Kenson products. Suitable for one child only, it includes 90 magnets. Some are printed with the desired behaviors (saying please and thank you, loading the dishwasher, getting ready for bed) and others are reward magnets (Great Job!, Awesome!, You did it!). It has space for seven goals or tasks for each day but does not include a space for identifying goals and rewards. Like the other chore charts, it has a bright, colorful presentation. It does not have a magnetic backing and therefore needs to hang from a hook on a wall or door. Like all Melissa and Doug products, it comes with a 100% Happiness Guarantee. If parents and children are not completely happy with the chore chart, they can call the number made available on the chart itself and “we’ll make it right.” Again, this chart is not recommended for children under three. The Learn & Climb Kids Chore Chart retails for approximately the same price as three of the above-mentioned charts. A cheerfully colored product made with sturdy, magnetic backing, it is sure to stay affixed to any magnetized surface such as a refrigerator. Parents and children can choose from 63 chore and behavior tokens and blank activity magnets allow you to customize these as well. Tokens are broken down into several categories including morning routine, bedtime routine, household chores, outdoor chores, healthy eating, good manners, and social manners. There is space for seven tasks, and this chart includes a smaller chart for setting goals and determining rewards. As a bonus, it can be used for up to three children at a time. Several reviewers liked that as their children grew older, this chart would still be relevant. Others liked that it was well constructed. Like the other charts, this product is also recommended for ages three and above. 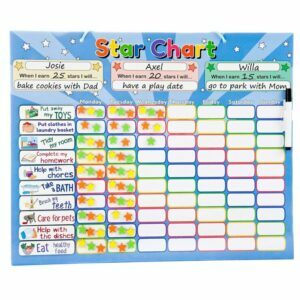 For a slightly lower price point, the Magnetic Reward Behavior Star Chore Chart has been well-reviewed by purchasers. Parents can display this chart wherever they like since it has a magnetic background so that it will stick to a refrigerator and a hanging loop which allows it to be hung on a wall or a door. It can accommodate the chores of up to three children. Like the others, it is pleasing to look at. At the top of the chart, children can identify rewards they would like to attain when they reach their goals. This visual reminder is a strong motivator. 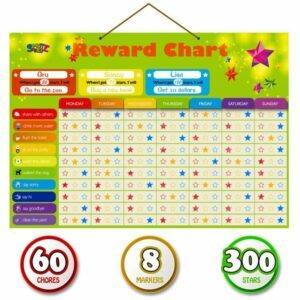 With 30 task magnets and 30 blank ones available for you to customize, along with 300 magnetic stars, the Magnetic Reward Behavior Star Chore Chart provides good value. Tasks include: tidy my room, share with others, care for pets, do my homework and many more. There is space for ten chores on this chart. Thicker magnets means that they are more likely to stay attached to the chart. Our favorite product overall, this chart is well made with a strong magnetic backing. There is little chance that this product will slip off the fridge no matter how it is jostled. Attractive, yet not too busy, it provides a variety of different areas for chores and good behavior and is capable of being shared with up to three children. This can set up a healthy competition and motivate children to complete the tasks their siblings have already completed. Having a separate area for goal setting and rewards is also helpful. Many parents identified an appreciation of the chart’s ability to grow with their children. This is a product that could conceivably be a part of your family’s organized household for many years to come. While, the Melissa and Doug Deluxe Wooden Magnetic Responsibility Chart is the least expensive of the charts we have profiled, the potential issue of the board warping and affecting the functionality of the chart is problematic. 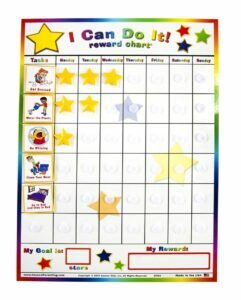 The Magnetic Reward Behavior Star Chart has fewer issues, allows up to three children to participate, and has space for identifying goals and rewards, and is thus, a superior product. As one satisfied parent expressed, “This is awesome for my toddler. I was skeptical about the magnets at first but they are strong. They stick well… I really like all the extra tabs it came with and the option to hang it up instead of putting it on the fridge.” This is a great, slightly less expensive product.